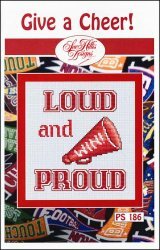 Give A Cheer, Pack of 3 [C6766] - $18.00 : Yarn Tree, Your wholesale source for cross stitch supplies. Cross stitch pattern by Sue Hillis Designs. The verse "Loud and Proud" with "Win" on a megaphone. Pack of 3 charts, order by the pack. Stitch count 69w x 76h.